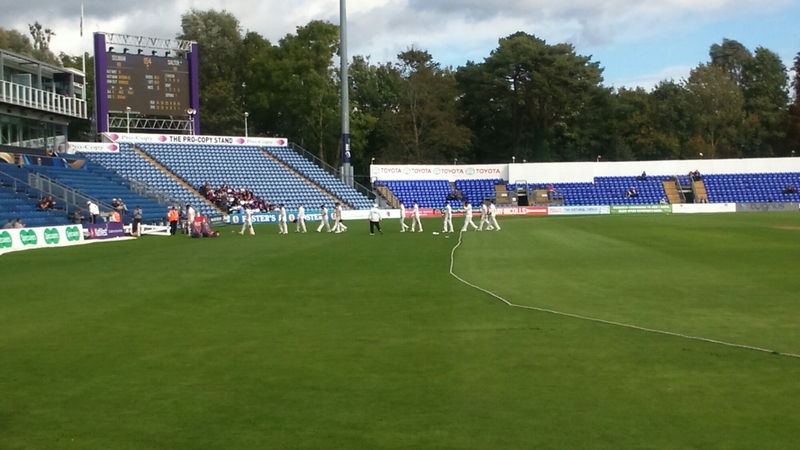 Today I saw my first day of County Cricket this season at Sophia Gardens. It was actually the 3rd day of Glamorgan against Kent, which also turned out to be the last, as Kent won by six wickets. Defeat for Glamorgan looked pretty inevitable after a horrendous first innings batting collapse from 57-0 to 94 all out. Although they dismissed Kent for 174 and scored 274 in their second innings, the lead of 194 never looked like being enough. On the other hand Yorkshire won their latest match against Essex despite being all out for 50 in their first innings! 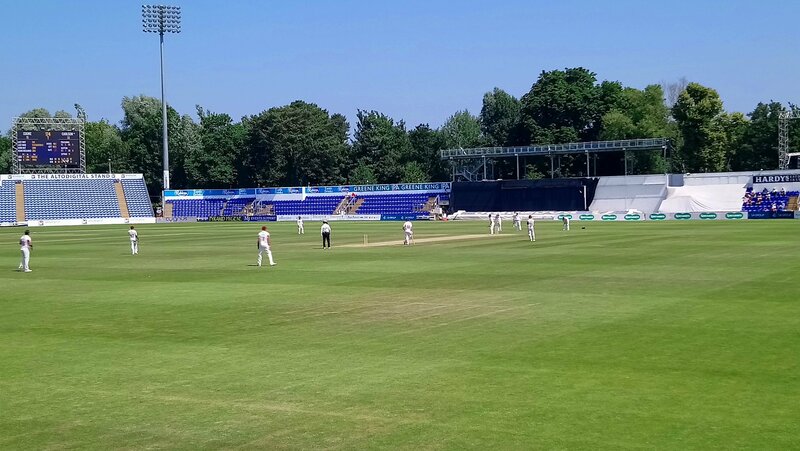 As it turned out, in the warm sunshine and good batting conditions, Glamorgan’s bowlers tried hard but didn’t have much luck and never really looked like precipitating the sort of collapse that they needed to win the game. Today’s play began with a farcical delay caused by a leak in the underground drainage system beneath the square which caused a wet patch. Play was delayed until 12.40 and the players had an early lunch while the sun did its work drying out the square. I’m not sure how this happened but it didn’t affect the game, which was always going to finish today given that there was no chance of the weather intervening. .
A very disappointing result for Glamorgan, but hopefully they can rebound in their next game. 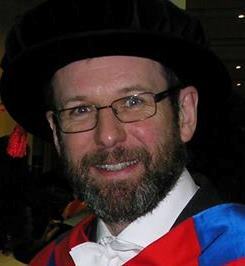 Anyway, just before 2.30pm those of us inside Sophia Gardens (only abiut 250) could hear the sound of fireworks from the Cardiff City Stadium (which is about 20 minutes walk away). Despite only drawing today’s match against Reading, Cardiff City are promoted to the Premiership for next season in second place. They have Birmingham City to thank for that, who beat Fulham 3-1 to secure their Championship survival and prevent Fulham from finishing ahead of Cardiff. Miss Lemon will be pleased. At the other end of the table, Barnsley, Burton Albion join already relegated Sunderland in League One. The three relegated clubs, once again, are all from the Midlands. It’s strange how often that happens..